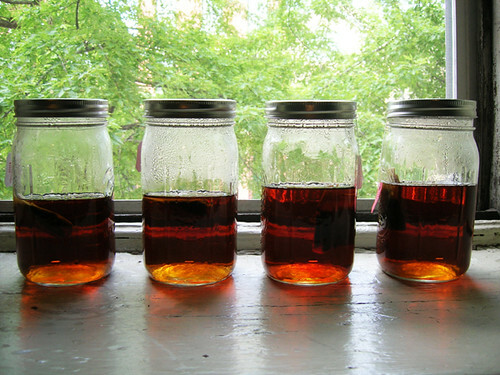 Despite their appearance on this sunny windowsill, these are not jars of sun tea. Let me back this up, I wanted mason jars to put cut fruit in and really just wanted to get, like, four mason jars. I could only get a box of twelve mason jars, though. So now I have all these mason jars. And also I stopped drinking iced tea, because I cut sugar and so Sweetie Tea is out. And the whole point of sweetie tea was to make a pitcher of sweet tea concentrate to splash over a glass of water, so it lasted all week. Unsweetened iced tea gets cut 50/50, I was going through a pitcher every two days and dragging out that saucepan all the time. It was just so much easier to drink water. This is the longest story about iced tea ever. Never sit next to me on a bus. So then I thought, hey, sun tea in mason jars. But then I read in Snopes that sun tea can breed bacteria, along with a bunch of peevish comments that no it doesn't, it does too, nyah, your mom. Seriously, people? I trust Snopes more or less; but really it's more like Pascal's wager, just don't make sun tea and you won't get food poisoning from sun tea. If you're going to use Pascal's wager in conversation after this, I suggest you look it up because it has nothing to do with iced tea. So I boiled water in my kettle and poured it over one tea bag per jar, up to the pint mark. [ETA: You know what, two tea bags per jar is better. YMMV.] Close the lid to let it steep and set the timer for 15 minutes, then fish out the tea bags and let the jars cool. Then top them off with water and put them in the fridge, and you can pour yourself a glass of iced tea from a jar whenever. Or you can drink from the jar; but it is a quart jar, that's a lot of fluids.